The Virginia chapter of the America Institute of Architects hosts a conference every November that is called “ArchExchange East.” It’s a fabulous learning experience for me and my students. Most of our department attends the event. I’ve included photos of some highlights. On November 8, my students and I attended ArchExchange East, sponsored by the Virginia chapter of the American Institute of Architects (AIA). We participated in lectures and professional development seminars. We networked and visited the exhibition hall. One of my favorite sessions was about women architects. It was presented by Martha Culpepper and Jennifer Rhoades of Galve and Holmes Architects. Their presentation was inspiring and packed full of helpful information. They included marvelous graphics. They discussed important architects and designers throughout history and from today. Following the presentation, my students Imani Parker and Tamia Smallwood had many questions for the speakers. Jennifer Rhoades and Martha Culpepper exchanged ideas with them for the better part of twenty minutes. …Jessica Pearson presented a fascinating case study about spatial planning in architects’ offices. She is comparing the working environments of offices that win top design awards with typical firms and she is identifying differences. In the exhibition hall, I caught up with architectural colleagues (like Joel Andre and Georgie Marquez) as well as former students (like Fred Perry, shown here). We had the chance to hear Bernard Tschumi speak. He is a Swiss architect who used to be Dean of Columbia’s architecture program. I presented reflection photos from Dublin in the Pecha Kucha session. Pecha Kucha is a quick-paced presentation format that is being used all over the world. At the end of the evening, Virginia Tech held a reception for alumni. Jack Davis, the Dean, welcomed us. And I had the chance to chat with my friend and mentor, Lucy Ferrari, who was visiting from Carona, Switzerland. Sometimes gravity is an architect’s friend. In fact, architects can use gravity to human advantage in all sorts of ways. In Ecology class today, I showed some diagrams of systems that use “thermosiphoning.” That’s a fancy word referring to gravitation pull that moves fluids (like air or water). The idea is that warm air (or water) rises and cold air (or water) sinks… because a liquid is heavier and more dense when it is cold. So, we can let gravity do the work if we think a system through. Sometimes we need to move liquids in directions they don’t naturally want to go, and then we need to add electric pumps or fans to our systems. Today, I showed my second year architecture students a tromp wall system as well as a diagram of an open loop solar hot water system. In that type of system, you let the sun heat the same water that you will use to shower, wash dishes, or drink. To get them involved, I turned posed a problem for them to solve. I asked them to pull out a sketchbook and combine the solar collector and the heat exchange into a single diagram. They needed to figure out how you could use water with water with glycol (i.e., antifreeze) in it to collect the sun’s heat and then use that same liquid to warm the water for someone’s shower. The challenge was to transfer the warmth into potable water without tainting it. A couple of students caught on fast. After everyone had given it a try, I let them help each other. More and more people got it. At about the same time, I asked a four of the students who caught on quickly to draw their diagrams on the board and then explain how they worked to the class. We all put our heads together to analyze the designs. Eric Brown, Jalin Williams, and Janine Stewart caught on quickly. Eric Brown’s system uses a roof-mounted storage tank. Janine Stewart replicated a system she had seen during the Hampton Roads Solar Tour, at Dr. Ben Cuker’s house. In Janine’s system, the tank is down lower (so it can be hidden in the basement). Her diagram includes a pump for moving the glycol/water liquid around. Jaylon Floyd created the most straight-forward diagram. We discussed how to mix in colder water to allow the girl in the bathtub to regulate the water temperature. 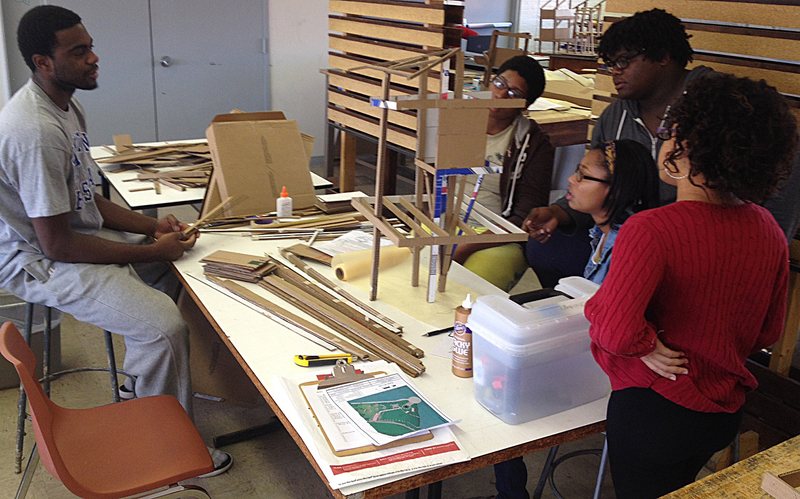 Hampton University’s second year architecture students are learning about gravitational forces and lateral loads by designing post and beam structures using a simple kit of parts (and adhering to a lot of fairly complicated rules). The intention of the assignment is for students to learn about cantilevering, stacking, and hinging. They also have to respond to environmental factors and work together in groups to enhance the site design concept developed by another student in the studio. You can see one of the site design models in the photos below. The cardboard frames you see represent the structural systems of small cabins that nestle into the site design. I’ve asked them to build the structures at such a large scale (1″=1′) so they can really get the feel of what the various structural components are capable of doing. Once they achieve suitable concepts, they will model their frames in wood. Fingers cross that that will happen by Wednesday! Thanksgiving is just around the corner… only three weeks of classes left to go this semester… so much to learn, so little time. They still have to have the interior space, design building skins, and illustrate their designs with diagrams and measured drawings. All that, in addition to completing their Physics, Architectural Representation, Architecture History, and Architectural Ecology course work. Whew! This group is evaluating the design of a structure based on the form of a tree. Discussing STEAM subjects: Caroline Martin, Dr. Judy Stewart, Orlando Robinson, Dr. Michelle Claville, Romdon Roopchan, and Dr. Shannon Chance. Big things are happening in the world of STEM education in Virginia. Two enterprising educators, Caroline Martin and Dr. Judy Stewart, have founded the Virginia STEAM Academy. Their public, 4-year residential program in Science, Technology, Engineering and Applied Mathematics is set to open for its inaugural cohort of students in the fall of 2015. Last summer, Judy and Caroline conducted a summer program to get the ball rolling. They have been working on the Virginia STEAM project since November 2010, and I’m happy to say that I’ve had some level of involvement since February 2011. Although I took a year away during my Fulbright fellowship, a Wednesday meeting on Hampton University’s campus helped me catch back up. I’m fascinated by two specific aspects of the planning Caroline and Judy are doing: (1) securing and preparing facilities on the former Ft. Monroe that will house 1000 high school students and 75 teachers (who will live on-site with the students) and (2) designing the curriculum to support quality learning and innovative teaching. They are such innovative thinkers and they know how to get things done! Their vision for the school is remarkably aligned with the research I’ve been doing on integrating design thinking into engineering curricula and on tracking learning outcomes that accrue as a result of hands-on, problem- and project-based learning. This Academy is going to open a while new world of possibilities for Virginia and her citizens. My sister, Heather , was lucky enough to attend the Governor’s School for Science and Technology in Roanoke when she was in high school. However, the daily commute — an hour each way — was a real strain on her and the other three students from our county who attended with her. This new residential school will take the burden of daily commuting away, allowing the students and teachers focus on learning and generating new knowledge. I am thrilled the school will be here in Hampton Roads, and just a stone’s throw from Hampton University’s campus. This Academy offers an ideal setting for the study of history as well as STEAM subjects. Judy shared the current site plan. We met in HU’s new “multipurpose” building. Michelle and Ramdon told us about their nanoscience work. 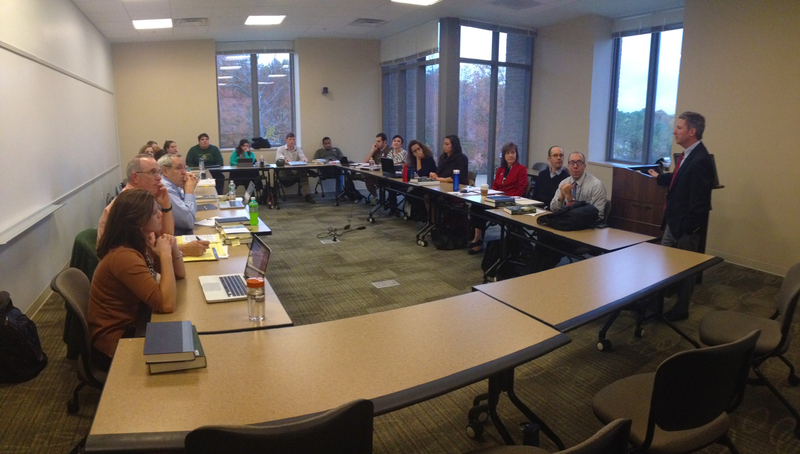 The William and Mary School of Education students I spoke with (about my Fulbright research) last week sent you a wave. My iPhone was acting strangely and I captured only the tail end of their wave, but I assure it was wholehearted. A sincere Virginia hello, from us to you! Last week I got to talk with a group of 60+ architecture students and faculty about design thinking, student development theory, and my Fulbright research… as well as how they connect to what we do in our department at Hampton University. Moments like these help us reflect on what we are. I hope they will also encourage my compatriots to explore ideas about what we want to become. My current research is situated in the constructivist paradigm. What does that mean? Well, my research ideas and techniques are founded on the principle that we humans construct the world around us — including the things we see and touch, how we know, and what we know — and that we are able to generate new knowledge. By discussing such topics, and considering collectively what it means to “design” and to “know” and to “learn,” we can become more international, purposeful, and effective in the things we do each day. One of our students, Rhama Mohammed, snapped some photos during the talk and loaded them into our Facebook page (I’m posting copies here). This provides a little glimpse of our department’s reality… surrounded by teachers (unfortunately, we don’t have images of any students in the crowd)… and a highly animated presenter. Fabiola and Donald Roman, as featured in the New York Time real estate section. Times are changing. Demographers tell us that younger set is shirking automobile ownership and moving closer into American cities. I’m proud to say that one of my former Hampton University architecture students, Donald Roman, is among them. He and his wife, Fabiloa, recently chose a condo in Brooklyn over the now-faded suburban dream. And, the New York Times just celebrated their accomplishment with a feature story. If I recall correctly, Donald was never a fan of the car. I’m happy to say that the heavy urban design emphasis of our architecture degree program served to strengthen his understanding of the benefits of population density and walkable city design. I’m immensely proud that Donald and Fabiloa, who met in an Upward Bound program when they were in high school, planned well and chose carefully. 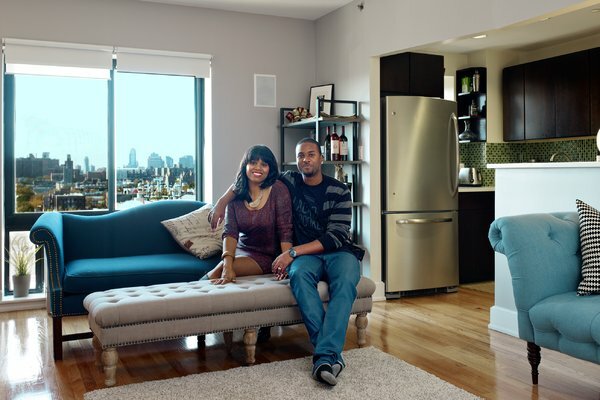 They overcame tremendous odds to become homeowners under the age of 30. And, they had the good sense to recognize that living in a densely settled area means shorter commutes and quick access to a huge range of services. During his time at Hampton University, Donald travelled with me to Tanzania on the 2005 Fulbright-Hays Group Project Abroad program I conducted. It was a true joy to have Donald among the 23 American students and 65 Tanzanian students on the program. He was immensely popular with the entire group and his soft-spoken but optimistic spirit uplifted our group every day. Our 2005 Fulbright-Hays group in Tanzania. Donald also made a big difference in my life when he introduced me to Malcolm Gladwell. He even handed me a copy of The Tipping Point as we were leaving Sunset Beach on our last day in East Africa. The Tipping Point is about “how little things can make a big difference.” Interestingly, the NYT feature ends with a quote from Fabi about little things that make a big difference in one’s quality of life (like a dishwasher — and I totally agree!!!). Thanks, Donald, for sharing with me your reflections on Gladwell’s ideas when we were beginning our trek home. Your insights got me interested enough to invest time in cracking the cover, and I had almost finished reading the book by the time my plane landed in Norfolk. Since then, I’ve read each of Gladwell’s new releases cover to cover. A new one, about David and Goliath, just hit the shelves and beacons me to read. There are interesting TED talks by Gladwell on David and Goliath and “choice, happiness and spaghetti sauce” to help get you started if you haven’t yet cracked the mystic of Gladwell’s storytelling ability… or if you just want to have some fun learning about the break through discovery of vegetable chunks. A stunning photo of Donald, taken by Loran Doran, who was then a landscape architecture student at Virginia Tech. Donald Roman and Joy Outlaw on one of the information-gathering outings for our urban design project. On safari in the Ngorongoro Crater, near Arusha. Donald chilling at Dar es Salaam’s Sunset Beach the day after the program ended.